Republican presidential candidate Mitt Romney collects supplies for victims of superstorm Sandy at a campaign event in Kettering, Ohio, Tuesday. As most of the country focused on Superstorm Sandy’s assault of the East Coast, Mitt Romney’s campaign hit new shameless lows in Ohio this week. Mitt Romney grew up in the Auto Industry. Maybe that’s why the Detroit News endorsed him, saying: ”Romney understands the industry and will shield it from regulators who never tire of churning out new layers of mandates.” Mitt Romney. He’ll stand up for the auto industry. In Ohio, not China. In fact, as Marchionne explained in a letter published in Forbes specifically refuting Romney’s claims, the company plans to invest $500 million in the Toledo Assembly Complex, bringing another 1,100 auto jobs to Ohio. What’s the real story here? Romney used this China line at a couple of campaign events last week, but refused to answer reporters’ questions about it. Then he began to air a TV ad with the same theme, which was widely panned. But not even the absolute assurance of Jeep’s chief executive was enough to shame Romney into pulling that TV ad. Instead, he doubled down with the radio ad, toughening the language and making a more direct suggestion that Jeep plans to move its operation to China. It’s true that Jeep plans to open new factories in China — to meet Chinese demand for its cars. What that means to Ohio, where Jeep builds a series of unique parts, is that there will be even more U.S. jobs. Don&apos;t assume that it was a no-brainer for a conservative newspaper to endorse a conservative presidential candidate. We recognize and are grateful for the extraordinary contribution President Obama made to Michigan in leading the rescue of General Motors and Chrysler. Had either of those companies been allowed to go under, Michigan&apos;s economic maladies would have become fatal. The president stepped up with the support the two automakers needed to keep themselves and their suppliers in business. We have said in past editorials that while Romney rightly advocated for structured bankruptcies in his infamous "Let Detroit Go Bankrupt" New York Times op-ed, he was wrong in suggesting the automakers could have found operating capital in the private markets. In that article, Romney suggested government-backed loans to keep the companies afloat post bankruptcy. But what GM and Chrysler needed were bridge loans to get them through the process, and the private credit markets were unwilling to provide them. Obama put a rescue team to work and they were true to the task. I’ll say it again: Romney’s lying, and he knows it. And he doesn’t really care — what he cares about is scaring auto workers in Ohio enough to flip their vote. In other news, on Tuesday, I mistakenly gave Mitt Romney the benefit of the doubt: I said he’d learned his lesson during national crises and was mostly shutting up and collecting Red Cross donations. 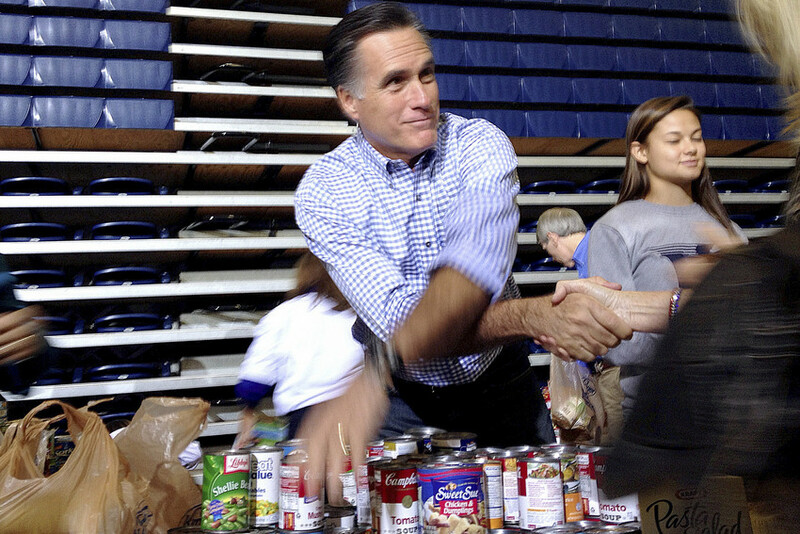 On the surface, both of those things are true: At an event in Ohio, originally planned as a rally and then renamed a “storm relief" some or other, Romney did gather up canned goods and other donations for hurricane victims — except that the Red Cross, the intended recipient, doesn’t actually accept any of the things collected. What exactly will Romney do with that stuff? He hasn’t said. Still, he managed to play his campaign video (campaign honcho Stuart Stevens can’t explain how that happened) and to come off awful rally-like. He is keeping his mouth shut all right — ignoring any and all questions about what’d he do as president with the Federal Emergency Management Agency. As a candidate in the primaries, he pledged to get rid of it. Fourteen times, that’s how often reporters directly asked Romney about this Tuesday; they were ignored each and every time. As to FEMA, here’s the bottom line: But for one botched job (Katrina) during George W. Bush’s tenure, when FEMA was run by a man who had no business being its head, the agency has been indispensable in national emergencies. JOHN KING: What else, Gov. Romney? You’ve been a chief executive of a state. I was just in Joplin, Mo. I’ve been in Mississippi and Louisiana and Tennessee and other communities dealing with whether it’s the tornadoes, the flooding, and worse. FEMA is about to run out of money, and there are some people who say do it on a case-by-case basis and some people who say, you know, maybe we’re learning a lesson here that the states should take on more of this role. How do you deal with something like that? ROMNEY: Absolutely. Every time you have an occasion to take something from the federal government and send it back to the states, that’s the right direction. And if you can go even further and send it back to the private sector, that’s even better. Instead of thinking in the federal budget, what we should cut — we should ask ourselves the opposite question. What should we keep? We should take all of what we’re doing at the federal level and say, what are the things we’re doing that we don’t have to do? And those things we’ve got to stop doing, because we’re borrowing $1.6 trillion more this year than we’re taking in. We cannot . . .